A performance full of organic rhythms and stories springing from one source – human being. 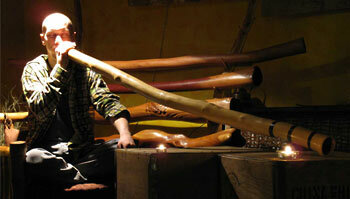 Pilnaj plays an ancient musical instrument of the Australian natives made by himself. He plays it his own original way, using the instrument’s basic drone, his voice, overblows, breath rhytmic, and creates complex, harmonic music that make the audience feel they listen to the “ancient orchestra”. Tu support grooves while singing use self-made string percussion and kick-pedals. In 2003, the first solo concerts. In 2007, production of the demo: D.I.D.G. Orchestra. 2010 relesed cd of electronic band Kus Kus Klan. 2011 - Duo Deshi album, 2014 - Opilon - album of duo Deshi, 2016 - Kopsloin - alubm of trio Deshane.